This morning’s ride was about 5.25 miles. 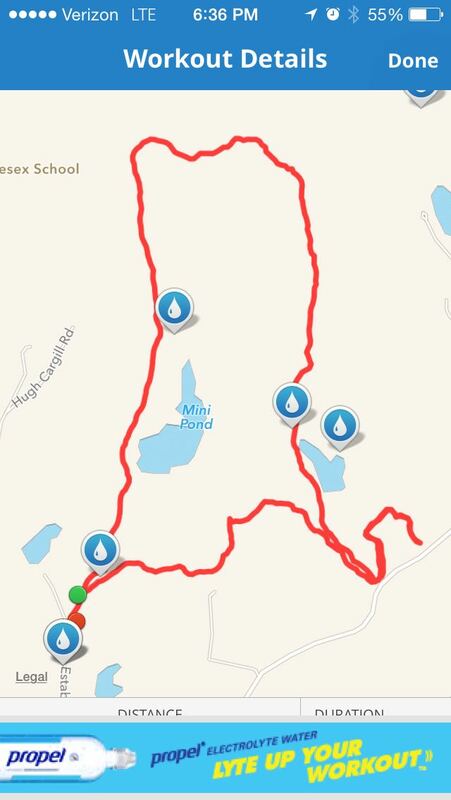 A nice loop that included fields and wooded trails. From reading other people’s blogs and the horse boards, people have very different riding plans for their horses. Some people ride mostly in the ring, some people ride out for miles. Some people work on perfecting the circle, or counting strides, or trot sets. These days, I’m mostly exploring the trails at the new barn. My typical ride is about an hour and a quarter and I cover about five miles and change. I’m waiting for a day when I can spend a bit more time out exploring — I have a ride in mind that will take at least another hour and I need to leave enough time to get lost and figure out how to get my way back. Right now I haven’t been doing any “ring” work. The new barn has a dressage ring that hasn’t been used in awhile; it’s part of the summer plan to get it up and running. This field is just so tempting! But right now the new trails are too tempting. In the morning, the wooded trails are still cool and the bugs aren’t bad. I’ve found some lovely open fields that call for a brisk gallop, and there are some great cross country jumps scattered throughout the territory. I’m using this as an opportunity to get more comfortable jumping Zelda. She’s a hoot because unlike Freedom, for whom every jump is a big jump (no matter the size), Zelda is very mellow. If she can step over one, she will! While out on the trails, I try to fit in some conditioning work and we do about a million transitions. I know we’ll have to do some real dressage soon. Usually I use the summers to rebalance my horses, get them listening to my leg and stretching through their toplines. What is your typical ride like? How long do you ride and what does your routine include? 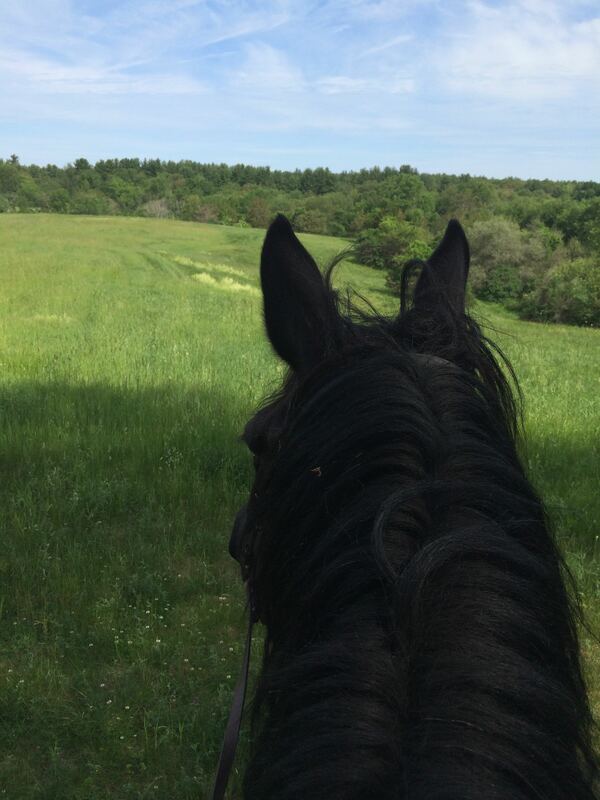 I spent many years at barns that didn’t have a lot (or any) trails so I guess I’m making up for lost time! I love just heading out on the trails exploring. I do a little competing in Endurance, but honestly like the regular trail time much better than any competition. But I do love when we can get some speed, and a surefooted horse maneuvering over tough rocky trails is just amazing. Some of the endurance riders are amazing. I used to ride the trails in Vermont and these endurance riders would go charging down trails that I had to think about descending at a walk! They were inspirational.